The Pacific Northwest is home to many beautiful and varied types of species of plants and animals. Green forests, mountains, woodlands, rivers, and lush grasslands are common environments in the region and have several types of creatures that make their home in the wild. Some bug species, however, try to invade your home and make their nests there. These unwanted intruders can be hard to eliminate once they start to take over. Once they’ve established your home as theirs, you may need to call a professional pest control company and use their training and expertise to take care of the problem. However, with proper preparation and deterrence techniques, you may be able to stop them before the problem gets out of hand and you have to call an exterminator. Portland has a few of these pesky creatures, and with some planning and good practices. Three of these bugs are especially common, but with a little bit of effort and preparation, you can tell these vagabonds to take a hike. Ants are a common bug found in most areas of the country. But different climates have different kinds. One type that’s common around the Portland area are teeny-tiny sugar ants. What they lack in size they make up for in number, and hundreds or even thousands of these little guys can take over portions of your house. The simplest way to avoid these ants is to make sure they don’t have a food source. You can do this by thoroughly cleaning up any area of your house where you eat. While the colloquial name “sugar ant” refers to many different species of small ants, most ants won’t make their home somewhere without a source of food. If you’re only seeing them in a small, localized area, you may be able to contain them before they spread. Sweet bait ant traps will often attract tiny ants and are usually mixed with some kind of poison that will kill a small group. Just make sure to keep them out of reach of pets! A colony, however, may be too hard to take care of by yourself. 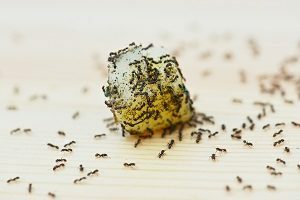 There can be hundreds of thousands of ants in one colony, and if they somehow manage to make their home in or near yours, you might feel like you’re constantly killing them but making no progress. If this is the case, call up professional exterminators and they’ll be able to use their equipment and training to take care of the colony for you. Box elder bugs are those little black and red guys with the long antennae. They’re winged insects that typically appear in fall and spring and are about half an inch long. 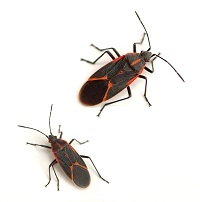 These bugs don’t tend to damage your house, but they congregate in large groups and can be extremely annoying when you come home and find that your siding is mysteriously painted black and red. And moves. These bugs can be killed relatively simply by using insecticides. Spraying a pesticide or using diatomaceous earth will often be enough to take care of the ones at the outside of your home. If they’re inside, it can be a little more tricky. The best way to stop these and other bugs from getting in is to seal cracks from the outside. If they can’t find a way into your house, they’ll give up and look elsewhere. Like flys, these bugs get trapped on sticky surfaces such as flypaper or other glue traps and can’t escape. You can stop more box elders from getting into your property by using a perimeter treatment. By doing heavy spraying at the edge of your property, the bugs will be deterred from entering and will stay away. Instead, they’ll look for more accessible properties; maybe the neighbors. 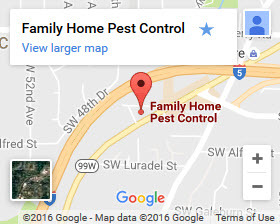 Fleas are one of the more annoying pests in Portland. Unlike sugar ants and box elders that are more of a nuisance, fleas actively bite people and animals. Because of the chemicals in a flea’s saliva, the bite itches long after the initial sting. Since these parasites reproduce quickly and can be difficult to find and kill, you have to act fast if you want to keep them under control. 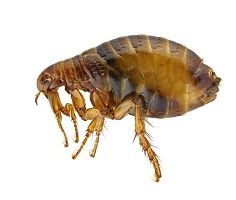 Fleas are tiny and hide in hard-to-find areas like on animal fur or carpet or furniture fibers. They don’t tend to congregate at one place like ants, so finding them can be tough. These miniature pests love animals, feasting off of their blood while simultaneously making themselves comfortable in their warm fur. If your cat or dog is itching excessively, it may be due to fleas. Animals have trouble killing the fleas by themselves since they’re so small and burrow into their fur, and sometimes your pets will do more harm than good by biting themselves. Unfortunately, once they’ve found a host, they’re hard to kill. Using a flea killer will kill the existing fleas, but you should look for high-quality options that also stop eggs from hatching so more fleas don’t appear after you think you’ve taken care of the problem. Also, killing the fleas on the host may not be enough. They might still be in your carpet or on your furniture, so using a flea spray throughout your house will make sure there aren’t any hiding away biding their time. Don’t let the pests win! With some proactive measures and a little luck, you might be able to stop these bugs from spreading into your house. Perhaps the most important step is to take immediate action when you notice the beginning of an infestation. If you act fast enough and take the precautions listed above, you may be able to take care of the problem yourself. But sometimes, even if you do everything right, the bugs still multiply and won’t go away. If that’s the case, you should have a professional take care of them, because whether you’re able to stop them on your own or need a little bit of help, the important thing is that the bugs don’t win.